Looking for cheap contact lenses? What causes eye strain and eye fatigue? Where to Buy Sunglasses in Australia Online? How do Multifocal Contact Lenses Work? When Can a Child Wear Contact Lenses? Can contact lenses cause eye infections? Offer : EASTER! Oasys and Oasys Astigmatism- Buy 2 or more, Get Free Digicase. Home > Information > Blog > Where to Buy Sunglasses in Australia Online? EYESONLINE have a fantastic range of sunglasses available to purchase online at the absolute best prices. So if you’re looking to buy sunglasses in Australia, you’ve come to the right place! We stock a range of leading brands of sunglasses for men and women. In fact, we’ve just expanded our range to include some very exciting new brands! Why buy sunglasses at inflated prices from a retail store? Shop online with EYESONLINE and save money. 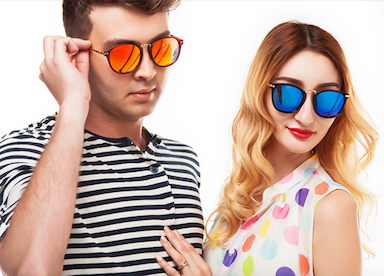 Find out about the many benefits of buying sunglasses online from us. What brands of sunglasses do EYESONLINE sell? We’re glad you asked. We’re very excited to announce that we’ve added some of the most popular, high-quality brands of sunglasses in the world to our range. There are also some selected products at reduced prices in our clearance section. Grab a bargain today! Are you sick of buying overpriced sunglasses from retail stores? Or perhaps you’re fed up with cheap imitation sunglasses that keep breaking? Either way, you’re paying too much money for your sunglasses. If you buy from a retail store, they have a lot of extra costs that we don’t have (staff, rent, electricity, etc. ), so we can offer products at a cheaper price. Or, if you’re the kind of person who buys the $20 sunglasses from the local petrol station (that somehow magically fall apart in a matter of days), you may end up buying 10 or more pairs a year. At EYESONLINE we only stock authentic sunglasses that are built to last. We also work very hard to ensure that our prices are better than any other retail or online store. What about postage costs for sunglasses? Are you worried that the money you save buying sunglasses online will be gobbled up by postage costs? Well, not with EYESONLINE. We offer free postage on all our sunglasses* (except for a few in our clearance section). That’s right, as soon as we’ve processed your order, we’ll send your sunglasses to any address in Australia at no extra charge via a standard Australia Post service. * Free postage is offered on any order over $115. Find out more about EYESONLINE in the information and blog sections of our website. Sunglasses on sale in Australia? Are you looking for sunglasses on sale in Australia? If so, EYESONLINE have your back pocket (and your eyes) covered with fashionable sunglasses at irresistible prices. Every now and then, we treat our valued customers to 20% Off Special Offers. Visit our Facebook page to check if we have any special offer on sunglasses at the moment. All you have to do to get our sunglasses on sale is head over to our online store and choose the product/s you want. Each product page has an ‘Add to cart’ button. Click that, and then view your cart. You’ll notice that 20% has been automatically deducted from your total. It’s as simple as that. With EYESONLINE, there is no gimmicks, no annoying hoops to jump through - just a good old-fashioned sale! Copyright © 2018 EYESONLINE All Rights Reserved. Brisbane, Sydney, Perth, Adelaide, Hobart, Darwin, Canberra.